This Kenner Strawberry Shortcake gazebo or garden house I believe is complete with table and chairs, BBQ, hammocks, cupboard for hats and clothing. The vines can be arranged to where ever you want them to be. (4) Huckleberry Pie;. 5) Blueberry Muffin. The condition is used, and I feel that is in. 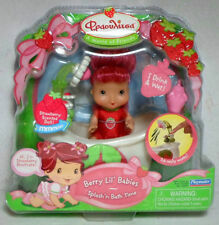 Hi, Strawberry Shortcake is in good condition with minor ware. She has a spot on her forehead, but her hair does cover it. Her shoes are borrowed. Her dress has a small tear on the lace of her dress. Custard has paint ware on the tip of his hat and mouth. (Please see pics for details and condition). I combine shipping on all purchases. Thanks for looking and have a great day. 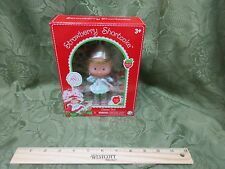 New in box Vintage Strawberry Shortcake Maple Stirrup & Oatsmobile. Brand new in box. Box does have some wear, however has never been used. Toys still in original plastic. Also included is instruction sheet, strawberry shortcake booklet, strawberry shortcake postcard, and “berry special friend” membership card. Vintage Strawberry Shortcake Jewelry Box Musical Pink Wood 1981 American Greetings. Adam Joseph Industries. The background on the top looks yellow in the photos, but it is a pale pink and off white polka dot print. It does work. It’s a wind up music box. I believe the tune is 3 Blind Mice. Inside is lined in a red velvet fabric. it measures approximately 2.5” H x 4.25” W x 5.75” L. Condition is Vintage. The top shows some light soil (which shows up more in the pictures than in person. The inside is very clean. Hinges are good. Shipped free with USPS Mail. This is a lot of 1980's strawberry shortcake miniatures and a 1980's Strawberry Shortcake Doll. These all belonged to my daughters when they were little girls. They have been in a storage box for the last 30 years. Strawberry Shortcake Vintage Deluxe Miniatures Lot. Condition is Used. This is a great lot of deluxe miniatures to complete your sets!! Huge Lot Of 1980s Girl Toys Strawberry Shortcake Care Bears Wuzzles Cpk Pvc. Condition is Used played with and in varying degrees of condition from needs a cleaning to like new. Some fun characters in this lot include wind up Pac-Man, eleroo wuzzle, Garfield, David the gnome characters, and a moncheechee driving a wooden car! Condition is Used. Strawberry Shortcake Dolls circa 1980’s. Strawberry Shortcake. Pie crusts, whipping cream and strawberries from Strawberry Shortcake House. Blueberry Muffin. Original dolls with clothes, shoes, animals and brushes. 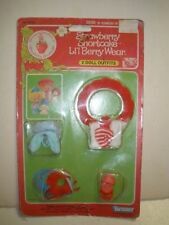 Vintage Strawberry Shortcake Lot Of Lots!!!. Condition is Used. You will receive all the strawberry shortcake items you see in the pictures. Items will ship within 1 to 2 days of cleared payment. Payment is due within 24hours of final sale. Huckleberry Pie - The box is in excellent condition with the only wear being to the plastic front as it turns the corner. His neck is broken and a part of it is stuck in the bottom of his head. His torso is also broken. Vintage 80's Strawberry Shortcake Pets Lot of 18 Frappe Frog Jelly Bear READ. Condition is Used. Please look at all photos the last picture has a dog and cat not sure if they belong they have always been with these pets. Second to last shows the bottom of select few that have marker on them I did not try to clean them. They are all from a pet and smoke free home. 15 of thr 18 were identified as pets of strawberry shortcake and friends 3 unsure of. See photos. Angel Cake's right arm has faded. What you see is ALWAYS what you get! I want to make sure you are getting what you want. Hi, Strawberry Shortcake is in good condition with some ware. The elastic in her outfit, hat and booties is a little stretched. Her left cheek has a mark on it. . She does have faint spots on her arms and legs, i took pics of all the spots. (Please see pics for details and condition). I combine shipping on all purchases. Thanks for looking and have a great day. THE TIN HAS A FEW SMALL SCRATCHES ON THE TOP DUE TO STORAGE AND AGE. Vintage Strawberry Shortcake, Berry Happy Home Dollhouse PRE-TEND brass(plastic) bed. Complete! Includes pretend Quilt ( crisp & clean) never even washed! Adorable pillow also excellent on both sides. Mattress again in clean crist condition. The bed comes in 3 pieces which ate all complete and in exvellent condition. Bevare putting it back togethet as remember it eas made ny American Greeting Co. in Hong Kong in 1983! You get everything in & on the bed. SSC. Condition is Used but everything is excellent. Non-smoking home. Shipped with USPS First Class Package. She is in great condition. She is a must have for any collection. I am helping my husband Bradley Justice (aka, shawstein) with the sale of this collection. Vintage strawberry Shortcake Jumper 0/3 M Plus print is faded otherwise GOOD. Condition also comes with bonnet like new and homemade little bloomers color bright didnt like wear bonnet haha is Used. Look at photos CLOSELY as ALWAYS Thank you for shopping with us today and come back again Shipped with USPS First Class Package. Doll and marsh mallard could use a gentle cleaning . See pics for condition as well. Hi, Lemon Meringue is in good condition with minor ware. The green in her stockings is a bit faded. Her hat is factory attached, but she doesn’t have bows in her hair. She does have a couple faint spots on the back of her head. (Please see pics for details and condition). 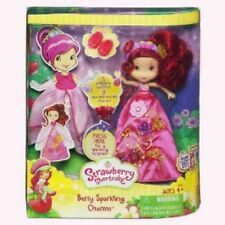 I have other Strawberry Shortcake auctions and I always combine shipping on all purchases. Thanks for looking and have a great day. . I wish I could say these were in better condition. The insides are not used; the covers have wear. I've shown front, back, and inside. All are AGC. The scrapbook is 1981, scribble pad is 1980, drawing & sketch pad is 1981, and two-pocket folder is 1982. Tops of the two pads are reinforced with tape. Although not in perfect condition, all four items are cute and very useful. Priority shipping. I believe all of them are in original clothing and shoes. Clean, smoke free. Hi, Cafe Ole and Burrito are in very good condition with minor ware. Her hat is factory attached. Her hair has lost her curls. The white of her hat is a bit dirty. (Please see pics for details and condition.) I have other Strawberry Shortcake auctions up and I always combine shipping on all purchases. Thanks for looking and have a great day. 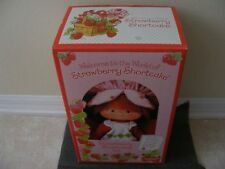 VINTAGE 1982 KENNER STRAWBERRY SHORTCAKE BUTTER COOKIE DOLL & PET NEW IN SEALED BOX. NICE SCARCE ORIGINAL COLLECTIBLE PIECE FROM A LOCAL ESTATE NON SMOKING HOME. One of the shoes is slightly discolored on top and has brown spots on the bottom. Vintage Strawberry Shortcake, Berry Happy Home Armoire Wardrobe Closet 1980s SSC. Condition is Used but excellent & clean. Shipped with USPS First Class Package. Box has been opened, but never removed from box. Includes Strawberry Shortcake Doll, Pet Custard, Comb, and removable outfit. Light strawberry scent. Fair to good shape. Need cleaning, hair styling. Incomplete sets, but may be what you need to fill out your collection! One doll is a "fake" (Lanard Jelly Bean Lucy Lemon - see last picture). west coast is very costly from my location in Illinois. New in box. Box shows signs of wear. Back of box has warped a bit. Still sealed - new - complete with DVD. Shelf Wear : When an item is listed in its original box and is described as showing shelf wear, we are referring to light rubbing (and possible color missing due to the rubbing) and usually corners slightly dinged. Previously played with and need cleaning please note Vintage 13 Lot Of Strawberry Shortcake Dolls figurines. Condition is Used. Shipped with USPS Priority Mail. VINTAGE STRAWBERRY SHORTCAKE STICKERS 1980s AMERICAN GREETINGS SCRATCH N SNIFF. Vintage Strawberry Shortcake, Berry Happy Home living room Tulip Floor lamp 1980s SSC. Condition is Used but excellent & clean. Shipped with USPS First Class Package. Printed on both sides, the top has handles cut into it for carrying. 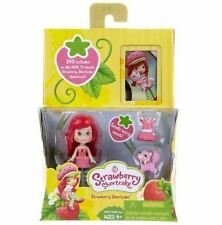 Basic Fun The Bridge Direct Classic Strawberry Shortcake Doll 6"
Basic Fun The Bridge Direct Classic Strawberry Shortcake Doll, 6"